Publishers Weekly to the draw more often than not. have been reviewing Indie titles and e-books with previous print editions. titles (yes, I confess to being an adult nonfiction selector). So let’s talk about the role of journals in your selection process. If you were to guess how many of your initial orders came from a journal review, what would you say? 50%? 25%? 80%? Has that percentage changed over the years that you have been selecting? What sources do you rely on beyond reviews? I asked an adult fiction selector that question this week and she said, “my gut.” As one who leans to art rather than to science, I’m fine with that answer. Others may point to the media, or favorite blogs/websites/e-newsletters, or patron requests. 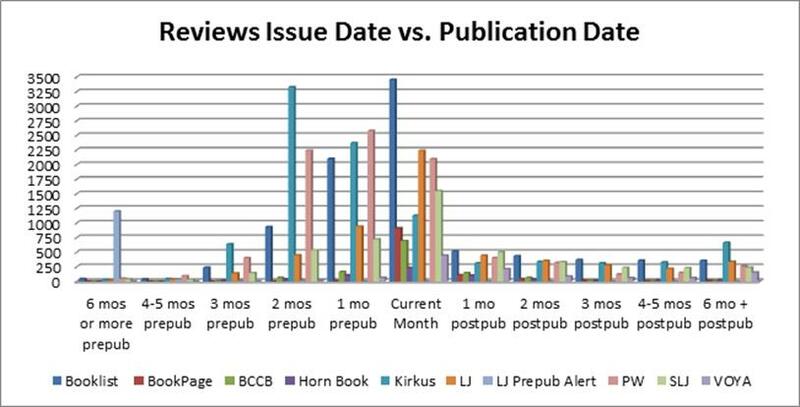 Rarely do I hear “review copies.” Since I get to play in a vendor’s database regularly (Brodart’s), I like to look at titles based on how their sales are trending to public libraries. What’s hot this month that wasn’t last month? And how about those areas where reviews are few and far between, like board books, large print, and Spanish language? In conclusion, we know that reviews play an important role, but they are not the be-all and end-all. Our customized TIPS profiling can take into consideration plenty of other factors, such as demand, print run, author, series, and publisher. The best profiles use creative combinations of all these. If you’re a TIPS subscriber, take a look at your profile summary and see if you should consider adding some new criteria. If you’re not, feel free to get in touch with TIPS@brodart.com. Statistical Disclaimer: While our numbers based on reviews used “reviewed in 2016,” our numbers for titles published in various categories represent titles “published in 2016.” We recognize they are not the same thing, but feel they are close enough for general comparison.